[by Lee Chae Bin/ translated by Yanchingsally Chu/ photo by Kim Chi Yoon] The cosmetics brand RE:CIPE has been known for its pure and truthful skin secrets. 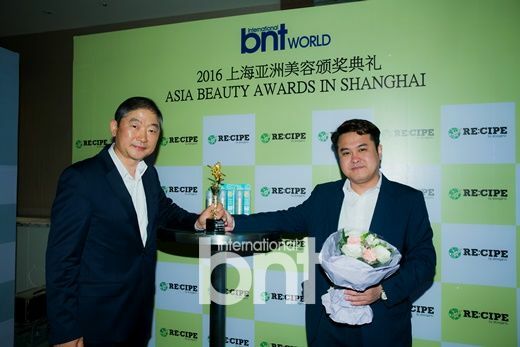 RE:CIPE won the Best Eco-friendly Cosmetics Award at ‘2016 Asia Beauty Awards in Shanghai’ on May 19. RE:CIPE, established on the basis of philosophy and faith in skincare’s nature, is a natural handmade cosmetics brand that finds natural raw materials of high quality to ensure safe skin care. The brand launched the first transparent sun spray in Korea and has reached five million unit sales in China, showing the power of Korean cosmetics. ‘2016 Asia Beauty Awards in Shanghai’ recognizes internationally famous brands and outstanding products that lead the beauty trends in Asia to excavate new beauty brands and products. It aims at developing evaluation indicators of K-beauty brands and providing evaluation standards for consumers to select the best product.